Three types of automatic security lights can make your home safer with minimal effort or cost. Some turn on automatically from dusk until dawn, while others switch on with motion sensors if something or someone moves on your property. Programmable interior lights also offer a measure of automated security. Find out the advantages, drawbacks and quirks of each type. Police and security experts recommend installing lights with motion sensors behind your house. These lights can alert you to intruders, while also keeping you from tripping over the shrubbery although they must be the right intensity and sensitivity. These lights typically use infrared sensors that detect a temperature difference when a person passes the sensor. However, animals and high winds may trigger the lights if the sensitivity is set too high. If it's set too low, a stealthy burglar can avoid detection. Take the time to find an adjustable light, and set the sensitivity correctly. Also consider lights that advertise a wider range than you actually need. In real-world conditions, the range is likely narrower than advertised. Some of simplest, most inexpensive models run on batteries or solar cells, and use LED bulbs. These require no wiring, but some LED bulbs may not be bright enough to either deter intruders or alert you or your neighbors to suspicious activity. Police recommend installing lights that allow you to see 100 feet and identify colors. On the other hand, make sure the lights are not so bright that they disturb neighbors and become a nuisance. Motion sensors are likely less effective for the front of homes. Animals or passersby on the sidewalk are too likely to trigger the sensor. Instead, look for lights that illuminate the front and sides of the house (particularly any doors and windows) after the sun goes down. Some security lights automatically switch on after dark. The same guidelines apply as with backyard motion sensor lights. Look for at least 100 feet of visibility, but not so much that your lights keep the neighbors awake. Make sure the lights are vandal-resistant and installed high enough to be out of reach. Don’t make it easy for burglars to simply unscrew the bulb and hide in the shadows. Solar models are easy to wire and easy on electric bills, but they may not provide optimal security. They are designed to provide 12 hours of light for every 8 hours of direct sunlight, but many users complain the nighttime light duration is much shorter. A third option for automatic security lighting is programming indoor lights to make it look like somebody is always home. Indoor lamps, overhead lights, or radios, TVs and other noisemakers can be connected to automatic timer switches that plug directly into wall sockets. Automatic light timers are also part of larger home automation systems. Many of these options are inexpensive and easy to install without professional help. However, it is best to call an electrician if you use hard-wired lights, particularly outdoors, where the lights or wiring could be exposed to water. 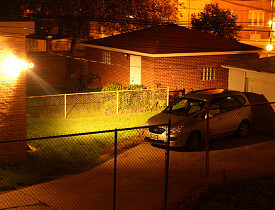 Lighting alone will not prevent all burglaries and other crimes, but automated security lighting can certainly help. Also reinforce your doors, locks and doorframes, and take other sensible security precautions.